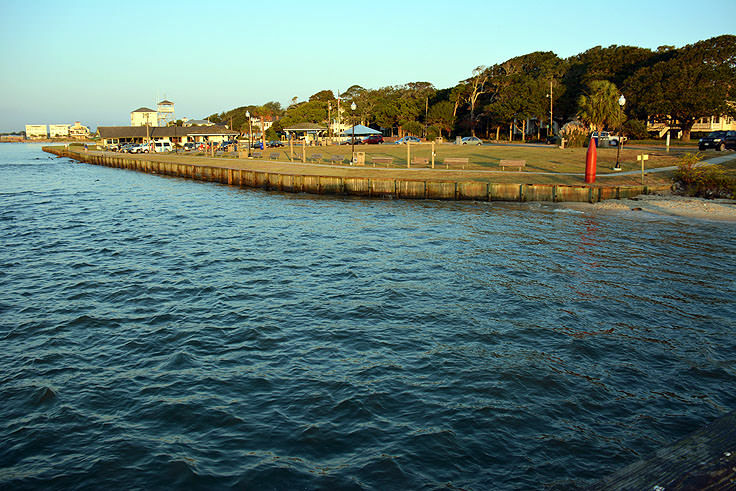 The Historic Riverwalk in Downtown Southport will quickly introduce newcomers to the waterfront scene in this coastal community, and will surely instill a newfound appreciation and overall enthrallment with this scenic laid-back region. 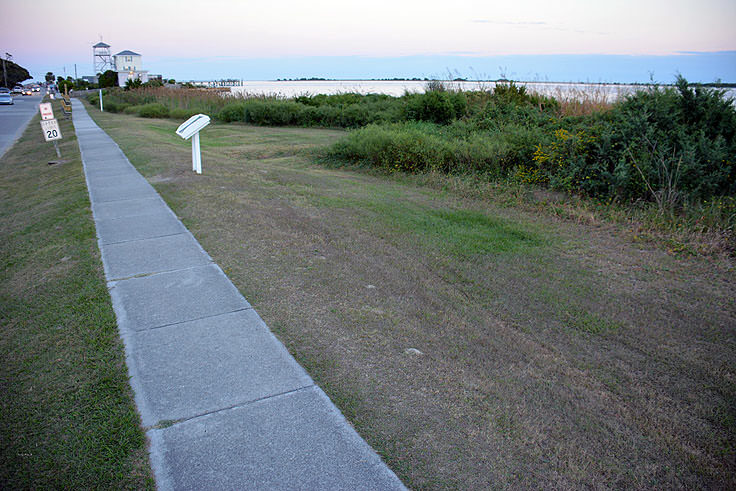 A short, handicapped accessible walkway that's appropriate for walkers of all abilities, this easy stretch of boardwalk runs parallel to the Southport waterfront, skirting past the banks of the Cape Fear River, and can easily be enjoyed as a romantic, informative, or family-friendly activity during virtually any Southport outing or exploration. 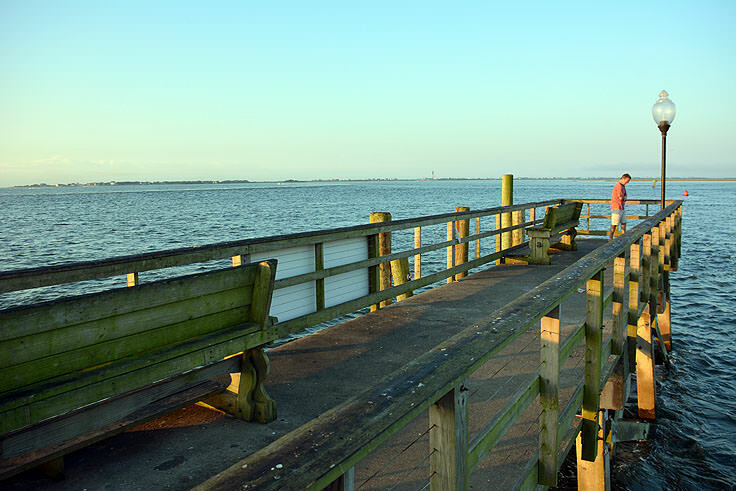 The Southport Riverwalk begins and ends at the popular Southport City Pier, a free-to-the-public attraction that comprises of a squat, short, and handicapped accessible pier which extends into the waters of the Cape Fear River. The pier itself is reason enough to visit the entrance to the Riverwalk, located at the very end of Southport's "main drag" of Howe Street, however tenacious visitors who want to extend the exploration further will love all the views and local wildlife sightings that the Southport Riverwalk has to offer. 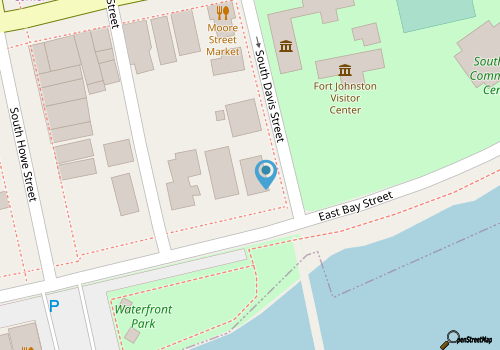 The start of the Riverwalk begins at the pier and the adjacent Southport Waterfront Park, and veers west, along quiet Bay Street, where it circles the small bay of the local Southport yacht basin before veering back to a smaller boardwalk that follows a modest local peninsula. Wooden signs are found throughout the well-maintained concrete and wooden trail, which point out both native species as well as historical points of interest. The entire route is about a .7 mile excursion, and yet the terrain covers three distinct coastal ecosystems, (specifically salt marshes, maritime forests, and beaches), which is one of the many reasons why this short trail has landed on the list of state-wide North Carolina Birding Trails. In fact, the route is quintessential strolling for local bird watchers, as a wide variety of visiting and native species can be spotted from various areas along the trail. At the waterfront city pier, bird watchers can spot Royal terns, least, and sandwich during breeding seasons, as well as plenty of Bonaparte's gulls in the winter months. The trail's end, which straddles the line between maritime forest and marshlands, is a great spot to relax and look for clapper rails, seaside sparrows, and painted buntings, which make regular appearances along the Intracoastal Waterway, as well as rare American white pelicans in the winter months, and swallow-tailed or Mississippi kite in the spring months of April, May and early June. Of course, you don't have to be a bird aficionado to enjoy this leisurely walk, and just strolling the trail has its own rewards in the form of world class views of the Cape Fear River. A number of benches are stationed along the way, to enjoy a lingering look of the waterfront scene, and visitors with a good eye can spot the famous "Old Baldy" lighthouse as well as the Oak Island Lighthouse in the distance from a number of trail-wide vantage points. The end of the trail is a reward all its own, as it's a great place to park the bikes in the adjacent bike rack, or leave the flip flops behind, and stroll out to a waterfront gazebo that overlooks the adjacent Southport Marina. A favorite romantic destination around sunrise or sunset, the view alone is worth the short excursion to reach the trail's distinctive end. 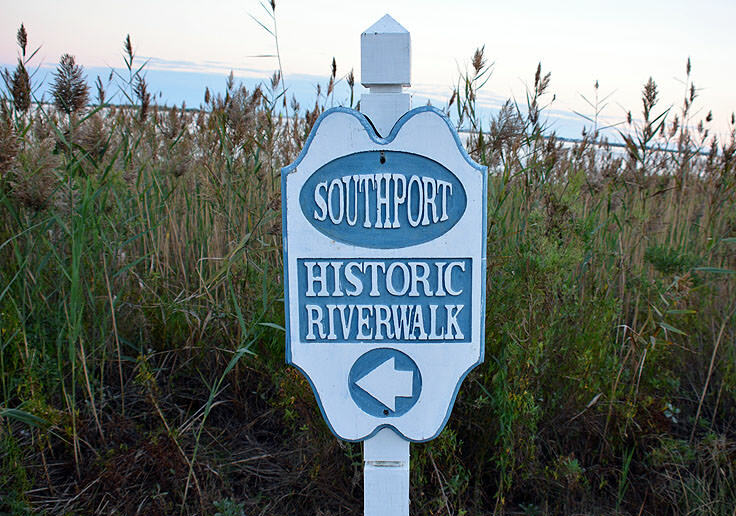 The Riverwalk is open to all Southport patrons, and plenty of parking is available at the adjacent Southport Waterfront Park, which borders both the City Pier's and the Riverwalk's entrance. 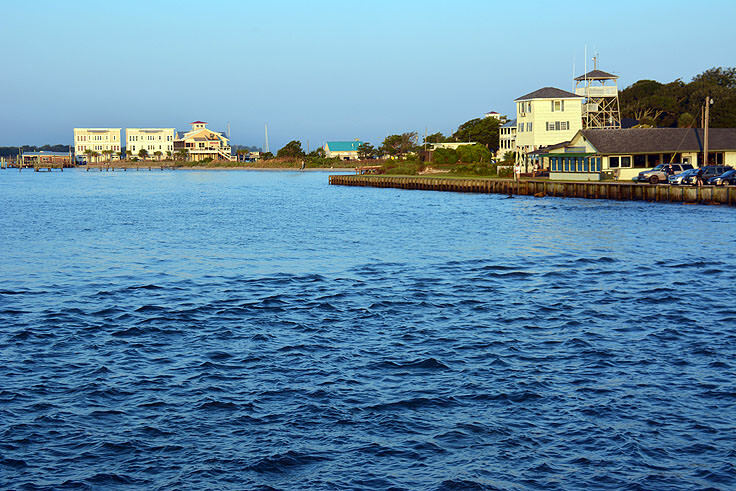 As an undeniably beautiful introduction to this gorgeous area, the Southport Riverwalk is basically a fantastic trek for any coastal newcomer to uncover the sights and sounds of this region which have propelled Southport onto the list of best coastal communities along the Carolina coastline. Overlooking a handful of marinas, gorgeous riverfront landscapes, and an abundance of native wildlife, the Southport Riverwalk is a gorgeous little excursion that is all but required for any Cape Fear area visitor.